Knockhatch Adventure Park01323 442051work Children's Activity CentreRain or Shine Come and enjoy an action-pack visit at Knockhatch Adventure Park. Come sliding down and skip across the water on the Wave Runner Water Slide, join the battle and help the chicken defend their house in the Cannon Arena, pan for gems in the Mining Area, ride the Runaway Train Simulator, play on Tommy Tractor in Play Barn or dig around for fun with the Construction Site Mini Diggers. And not forgetting the other attractions you can paddle in Pirate's Cove, bounce around on the Jumping Pillows, go rowing on the Lake, launch yourself off the Demon Drop Slide, or leap into Froggies the massive Indoor Soft Play Area. Stroll around the Farm and feed the animals and wander around the magnificent Owls. Watch one of the displays or take a ride on the Quadapillar, which happens daily. For a little extra expense, you can whizz around on the Go-Karts or the Mini Quad Bikes, jump up and down on the Bungee Trampolines, and climb high up the Rock Climbing Wall or zapp others playing the Laser Adventure Game. 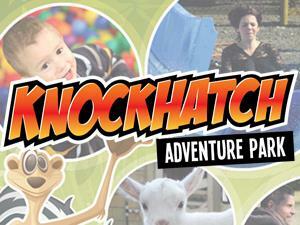 Rain or Shine Come and enjoy an action-pack visit at Knockhatch Adventure Park.